Simple machines are the most basic machines. They make work easier by altering force. 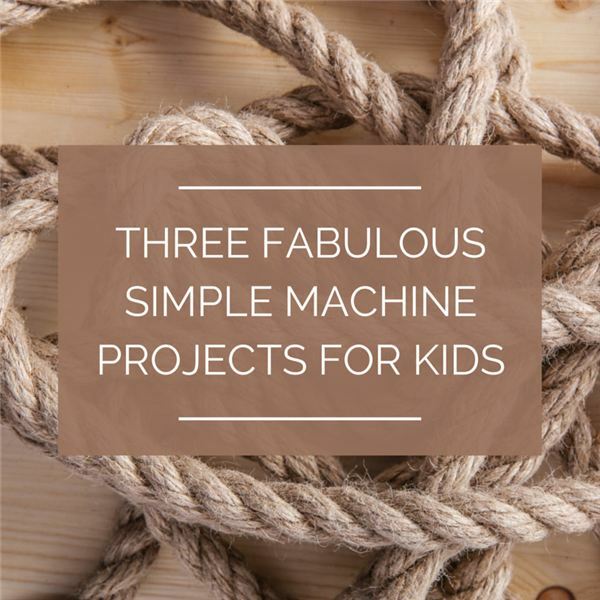 These easy-to-build simple machine projects explore a pulley, inclined plane, and a lever using common household objects. An inclined plane is a flat surface with one raised end used to lessen the force needed to raise objects. Is it easier for Barbie to climb straight up the book mountain or use the ramp? 1. Tie a string around Barbie and attach the rubber band to the string. Stack the books in a pile to make the 'mountain'. 2. Lift Barbie by pulling the rubber band straight up to the top of the book pile. Measure the length of the rubber band as you are pulling Barbie up the side of the mountain and record your results. 3. Use the board and book pile to make a ramp (inclined plane). 4. Pull Barbie up the ramp with the rubber band. Measure the length of the rubber band as she is pulled up the ramp and record your results. Which was the easiest way to move Barbie to the top of the pile? A pulley changes the direction of a force needed to do work. Can you use a pulley to send a snack to a hungry friend across the room? 1. Tie the ends of the string together to make a large loop. Put the pencils through the spool centers. Hold one pencil so the spool moves freely. Have a friend stand on the other side of the room with second spool. Wrap the string around the spools. 2. Attach the snack to the string with a paper clip or binder clip. Pull the string to move the chips. Did the chips move across the room? What did you think would happen? What could you change? What did you learn? A lever can change the size and direction of a force. Where should you push on a lever to get the best lift? What happens if you change the size of the fulcrum? 1. Place the pencil under the popsicle stick to make a lever. Place a bean on one end of the lever. 2. Drop the other coin from a height of 30 cm. Notice how high the bean jumps. 3. Repeat but drop the coin so it lands halfway between the end of the stick and the pencil. How high did the other bean jump? 4. Repeat the experiment, replacing the pencil with a fatter marker. How does this change the height the bean jumps? Try moving the fulcrum to different locations under the Popsicle stick. What gives the bean the best lift? The pulley, inclined plane and lever all make work easier by altering the force. These easily-made projects are a fun way to explore force and machines.